More school holiday baking today and these double chocolate cookies were a big hit! Most things that say 'double chocolate' include both melted chocolate and chocolate chips. Oscar and I are dairy free at the moment (apart from a small amount of butter) and we had no Lindt 85% which is our dairy free chocolate of choice, so I invented these! 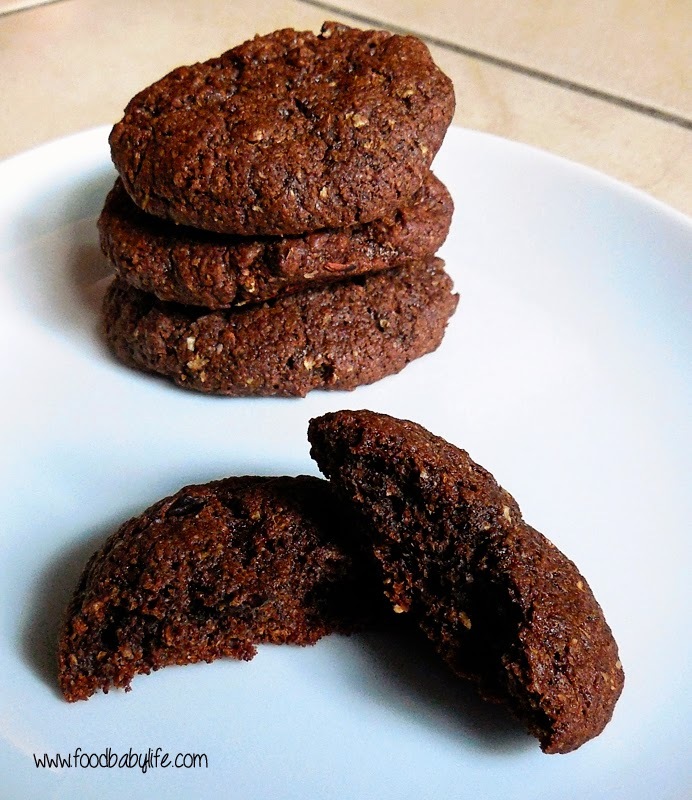 These cookies give a really intense chocolate hit with the raw cacao and cacao nibs. They are quite a grown-up chocolate cookie although my 3 and 5 year old taste testers couldn't get enough. We have been eating most of the batch straight from the freezer where they are lovely and chewy with a bit of crunch from the cacao nibs. SO good!! Preheat oven to 180 degrees / 160 degrees C fan-forced. Line 2 trays with baking paper and set aside. In a medium bowl, whisk together the flours, dextrose, cacao powder, baking powder and bicarb. In a large bowl, beat together the butter, vanilla and egg with an electric beater until thick and smooth. Fold in the dry ingredients and the cacao nibs until just combined. Roll the mixture into 24 balls and place on the prepared trays, allowing room to spread. Flatten each cookie with your fingertips then bake for approx 10-12 minutes. Make sure you take them out when they are only just done so you get a gorgeous slightly fudgy middle! Remove from the oven and leave to cool on the tray for 5 minutes before turning out to cool completely.